Any racing devotee of whom I've taken to calling 'DER TERMINATOR, nee Michael Schumacher surely knows what day today is for the seven times F1 world champion, right? As its strange to think one year ago exactly, I was bringing Michael home, after another outing down south to 'Awntie Harriet's, who many, many years ago was a close Schumacher ally 'O mine, although that Harriet's long gone; sadly having departed this world exactly one month ago at the momentous age of 95... Whilst obviously thee old Michael is never coming back either! 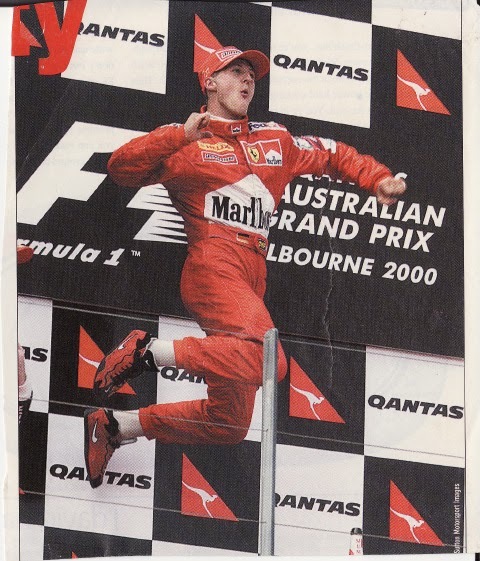 1) A much happier Schuey from his "Glory Days" at la Scuderia; foreshadowing more triumphs to come, circa 2000 Australian GP: culled from a long ago issue of the now defunct Ontrack magazine. 2) Michael Schumacher helmet visor strip acquired from Speedgear - a Zillion Years ago!